• Microwave Sensor - IP Rated. • Linkable - connect multiple sensors together for greater coverage. • Super sensitive - adjustable range. • Built-in Light Level sensor. • IR remote control set up (SET-IRT5). 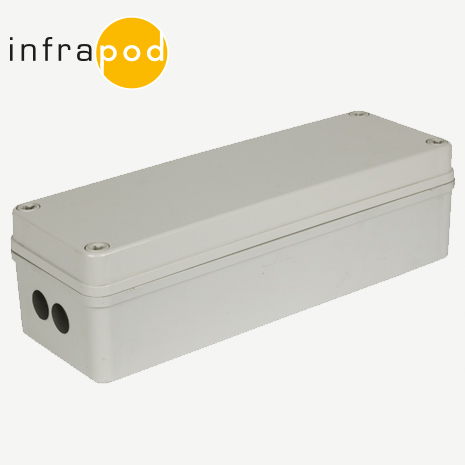 The SET-SMC-20-IP is a microwave sensor which utilises doppler radar to sense movement. Suitable for large enclosed spaces such as car parks and sports halls the sensor can detect movement up to 20 metres away. When movement is detected a volt free contact closure in the unit provides a signal back to the Lighting Control System, or a 240V feed to the relay can be provided for direct control of the lights. The unit also incorporates a light level sensor which can be programmed to keep the lighting OFF if there is sufficient natural daylight in the detection area. Setup of the control parameters such as time delay, light level and test mode is carried out by a separate Infra Red handset called the SET-IRT5.